This month’s newsletter contains updates from two IPSI Collaborative Activities, with three new videos produced with financial contributions from IPSI member the “Ink Cartridge Satogaeri Project” and cooperation by other members, as well as a new issue of the newsletter from another IPSI Collaborative Activity, the COMDEKS Programme. We at the Secretariat are very encouraged to see such active engagement from IPSI Collaborative Activities, and we hope that many more members will find productive ways to collaborate. We are also pleased to provide an introduction to one of IPSI’s newest members, the Hokusetsu Satoyama Museum Steering Council (HSMSC), and a recent case study from Conservation Alliance in Ghana. We hope readers will contact us with any projects that may be suitable for recognition as IPSI Collaborative Activities, to submit new case studies, or just to provide us with updates on your activities. Three new videos have been produced regarding recovery efforts in the Urato Islands in northeastern Japan, including a project initiated by Tohoku University and the United Nations University Institute for the Advanced Study of Sustainability (UNU-IAS) as part of an IPSI Collaborative Activity. The videos were made possible through financial contributions by the “Ink Cartridge Satogaeri Project”, an IPSI member jointly formed by Brother Sales Ltd., Canon Inc., Hewlett-Packard Japan, Ltd., Lexmark International K.K., and Seiko Epson Corporation. The main video is “Bouncing Back from Disaster – People Working with Nature to Create a Brighter Future for the Urato Islands”, while two others, “Urato, Home of Oysters” (Japanese language only) and “Urato, Beautiful Islands” provide additional stories and footage. All of the videos help to demonstrate some of the ways the concept of the Satoyama Initiative can help with the revitalization and sustainable management of SEPLS around the world. For more information on IPSI Collaborative Activities, please click here. According to its website, the NBSAP Forum is a global partnership aiming to support NBSAP revisions. It is hosted by the Secretariat of Convention on Biological Diversity (CBD), the United Nations Development Programme (UNDP), and the United Nations Environment Programme (UNEP), all IPSI members. In addition to a wide variety of discussions and news related to the NBSAP process, it hosts a number of useful resources for interested parties. 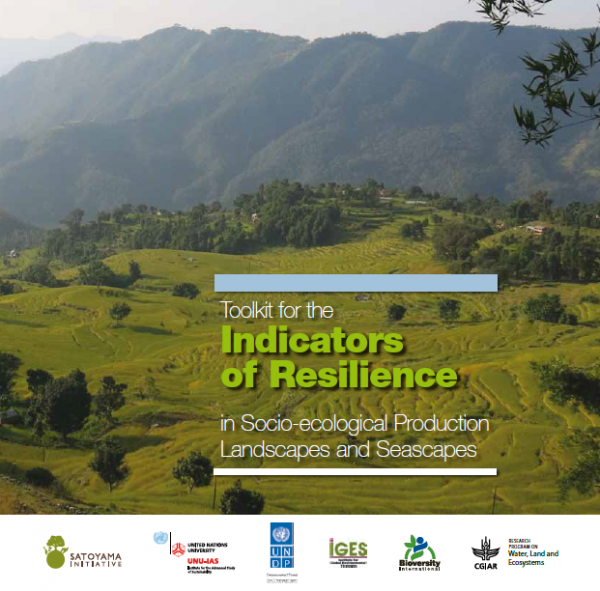 The toolkit publication was developed by the United Nations University Institute for the Advanced Study of Sustainability (UNU-IAS), Bioversity International, Institute for Global Environmental Strategies (IGES), and the United Nations Development Programme (UNDP) as part of an IPSI collaborative activity, and was launched at a side event of the IUCN World Parks Congress 2014 in Sydney, Australia. It is very exciting to see IPSI-related materials like this gaining more recognition in international venues. To see the article, please click here. Hokusetu Satoyama Museum Steering Council was established in March 2012 as the core organization promoting the Hokusetsu Satoyama Museum concept by citizens, organizations, companies, cities and towns, the Hanshin-kita District Administration Office, and the Hyogo Prefectural government. The purpose of the Steering Council is to develop satoyama (Japanese socio-ecological production landscape) areas in the Hokusetsu region (north of the Hanshin region in Hyogo Prefecture) as the “Hokusetsu Satoyama Museum (Eco Museum): Entire Region as a Museum,” and to promote their utilization in accordance with each user’s needs, such as environmental studies and outdoor activities, as well as production activities, thereby achieving sustainable conservation of satoyamain Hokusetsu and contributing to regional revitalization. In the Hokusetsu Satoyama Museum Concept, the “museum” is not a building where there is an exhibit, but rather satoyama of the Hokusetsu region themselves as the “museum”, with each of the satoyama (30 areas) in the Hokusetsu region as exhibitions. Currently, satoyama landscapes in the region are facing two problems: loss due to development, and reduction of biodiversity due to this loss. 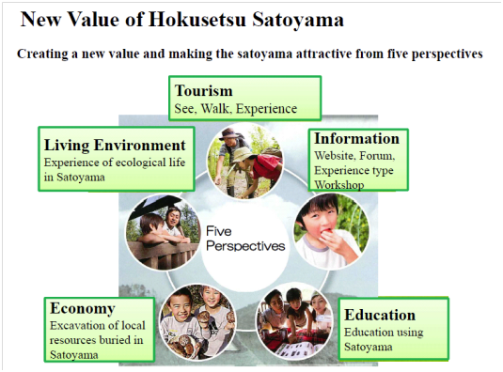 By the Hokusetsu region being regarded as “an entire region as museum”, HSMSC has implemented a variety of measures for the creation of new values of satoyama, conservation and sustainable use of satoyama, and regional development from five perspectives: Tourism; Information; Education; Economy; and Living Environment. The IPSI Secretariat recently received a case study report from partner organization Conservation Alliance, based in Ghana. The overall goal of the project in the case study is to mainstream biodiversity conservation into the cocoa growing landscape in the Kakum Conservation Area. This landscape is a biodiversity hotspot that also supports over 5000 cocoa farmers and their families. The farmers and their families like other cocoa farmers elsewhere in Ghana and the West African sub-region are producing cocoa at the fringes of forest reserves. With help from Conservation Alliance and its collaborators, these farmers are being organized into formal groups and trained in modern methods of cultivating cocoa. Results are: an increase in understanding and minimal use of agrochemicals; biodiversity and climate change issues; and a resultant improvement in the socio-economic situation of these rural folks. As a result of this intervention, more than 2500 farmers and their families living in the Kakum Conservation Area have been educated on biodiversity and climate change issues through a number of approaches including community meetings, durbars and media campaigns using community information centers. 350 farmers selected from 17 communities were enrolled into various farmer field schools established within the communities. These farmers were taken through the various stages of cocoa production and their facilitating skills were enhanced to enable them deliver training to other farmers in the area. It is expected that each of these farmers will train 3 more farmers per year. Through this cascading model, it is expected that all farmers in the project area will be trained after some time. Biodiversity data collection and farm mapping also provided important insight to the project. The full case study is posted on the IPSI website here.